Spring is a wonderful time of year, especially after the cold, dark, and dreary weather of winter. I’m always so excited to see the first dandelions pop up, as that means that warmer weather is on its way and I can soon make homemade dandelion salve! Foraging for dandelions isn’t difficult, as they are one of the most widespread and easy to identify “weeds” there is. There are so many wonderful things to do with dandelions, as every part of the herb is both edible and medicinal, even the root. This salve is made using locally foraged dandelions, and is the perfect spring project. If you don’t have the time to make it yourself, I sell this same dandelion salve in my Etsy shop, as long as I have access to dandelions. Read on for the dandelion salve recipe! 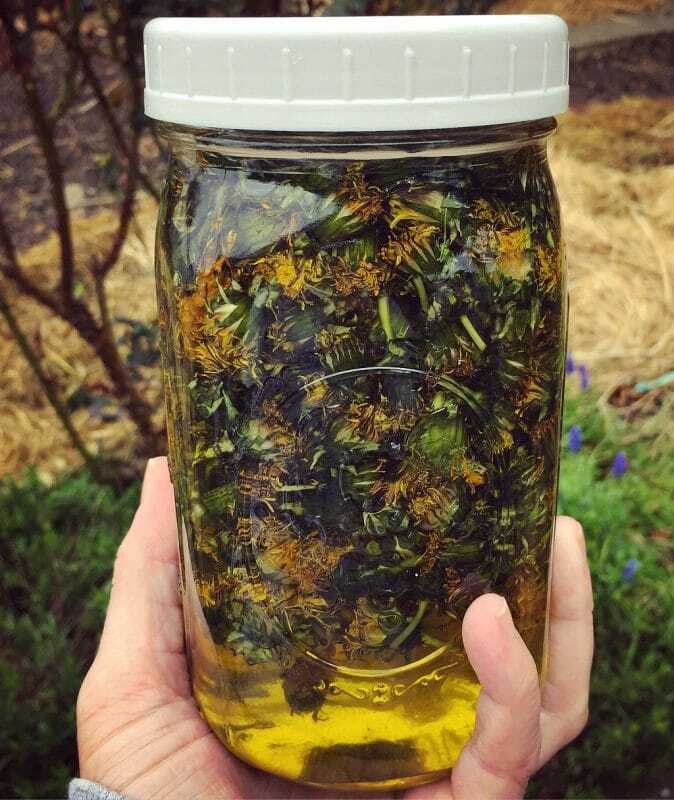 The first step in making dandelion salve is to make dandelion infused oil. 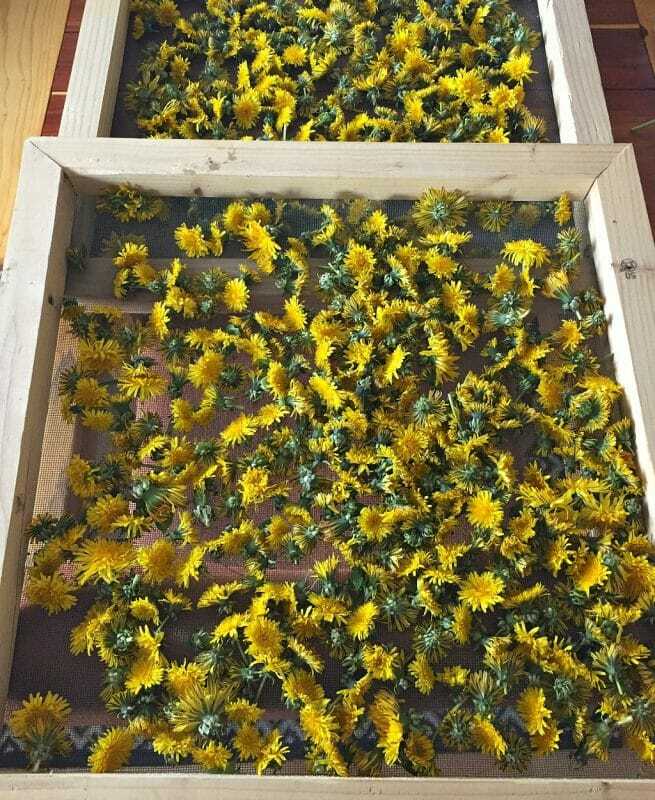 After you collect your dandelion flowers, it’s good to dry them for a day or two to remove the excess moisture. I like to do this on my homemade drying screens. Our neighbors yard was completely covered with dandelions, so we asked if we could pick some! If you do this, just make sure to ask first and confirm that they haven’t been sprayed with anything toxic. After your dandelions have dried a bit, put them into a jar and cover them with oil. The size of the jar depends on how much oil you want to make. A pint jar should yield about a cup of oil after straining, which is the amount you will need for this recipe. 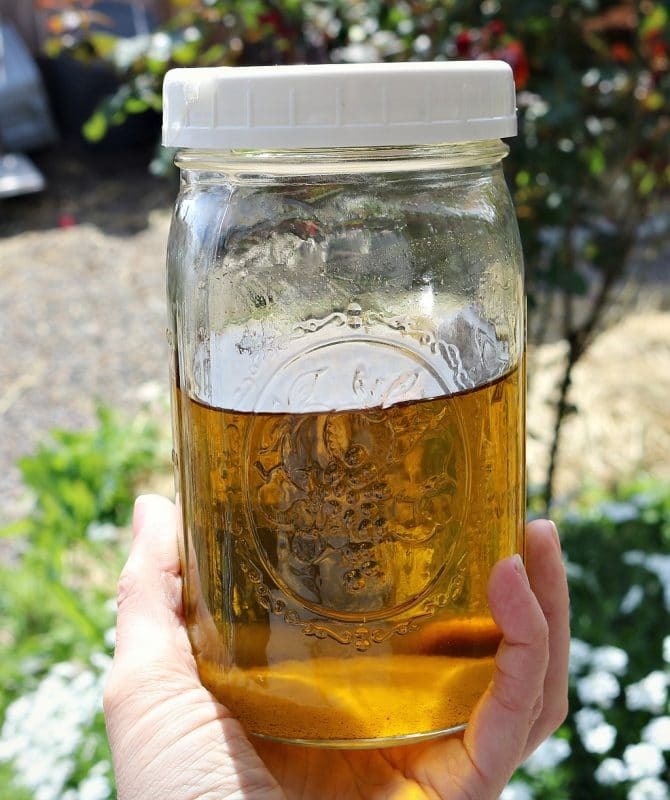 I wanted more oil than that, and I had a ton of dandelions, so I used quart sized jars. The kind of oil that you use is up to you, but I like to use a blend of equal parts extra virgin olive oil, coconut oil, and sweet almond oil. Let your dandelion oil sit in a dark place for a week or two, but not too much longer than that as it can spoil pretty quickly. Strain out the flowers using a cheesecloth so that you can really squeeze all of the dandelion goodness out. You will end up with a lovely golden oil! I prefer to use a blend of olive, coconut, and sweet almond as carrier oils when making my dandelion infused oil, as they are all nourishing for the skin in different ways. Shea buttergives it some richness, and local beeswax solidifies it. Essential oils of your choice give it a pleasant scent, as well as more healing benefits. Before making this dandelion salve, you will first need to make dandelion infused oil. You will also need some kind of jars or tins to keep the finished salves in. 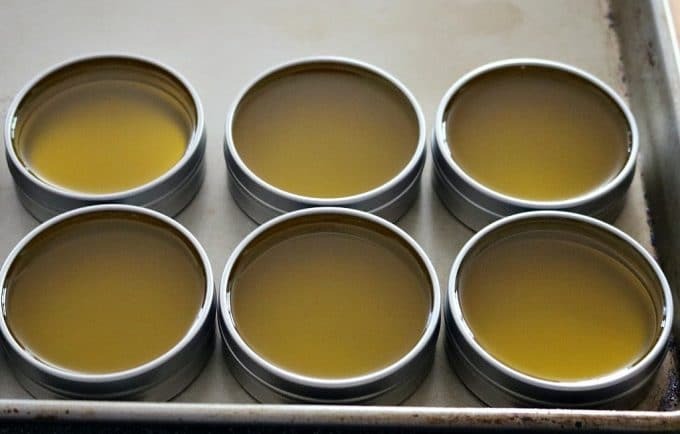 This recipe makes about 12 ounces of salve total, or six 2 ounce tins. Create a makeshift double boiler by putting a small bowl or a glass Pyrex measuring cup over a pot with about an inch of simmering water. Put the dandelion oil and beeswax into the small bowl or Pyrex, and heat until the beeswax completely dissolves into the oil, stirring occasionally. Add the shea butter and stir until it completely dissolves. Carefully pour the mixture into small jars or tins and let sit until the salve sets up completely. Dandelion flowers have pain relieving and anti-inflammatory properties, so this salve is good for all kinds of aches and pains. It is particularly good for sore and tired muscles and joints. Dandelion salve is also soothing and moisturizing for dry, cracked, and itchy skin. It would also work well as a lip balm for chapped lips. I really love how this dandelion salve turned out! It smells wonderful and is perfect on my dry hands and feet. It’s really quite easy to make, too. If you don’t want to or don’t have the time to make it, you’re in luck! I made enough to sell in my Coco’s Herbals Etsy shop, but they won’t last long as spring is the only time of year that I can make them. Get them while you can (in stock now for spring 2018)!